As a business owner, anyone always on tows to make sure you provide best services to the customers and gain positive review. 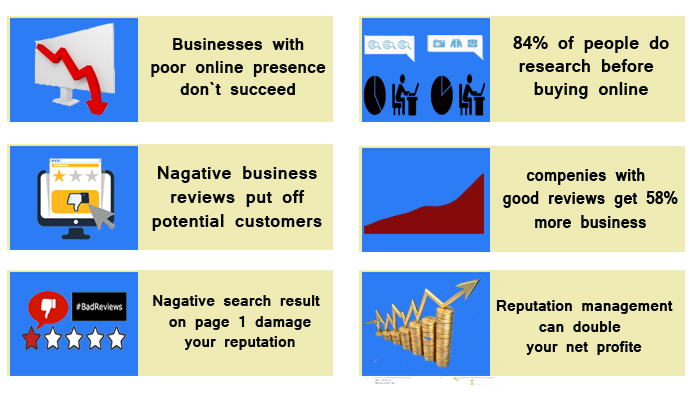 No one likes a bad review, and as a business owner, everyone wants to maintain a positive online reputation through these reviews. Despite your all efforts miscommunications and mistakes happen, and at some point, you’ll get a negative online review. We can help you with mitigating the damage that occurs due to situations which are out of your control. Nevertheless to say customer’s review has a profound impact on buying patterns. Customers are highly sensitive about buying product and services from companies have a bad review. Receiving positive reviews through various social media channels determines how new users perceive your business. Customer reviews are an essentially digital version of word-of-mouth marketing and have the potential to touch everyone who views your Pages and profiles. Reputation management in the digital age is a primary concern for business and companies striving hard to gaining a competitive edge over competitors. Whenever anyone thinks to buy online, one thing definitely was done by him is checking online reviews for that particular product or service. We generally see an aggregated “star” rating for product or service you want to buy. Online reviews hold a powerful effect on the behavior of the audience. Nowadays the number of online customers who read and trust online reviews is increasing significantly. More than 85% of consumers trust online reviews. One of the strong reasons is to check online reviews are the reviews are posted by strangers with various different experiences with product or service. if anyone enables customer review on site, This may lead to a positive effect on the company’s organic search. For new company’s each and every review written about their product or services increase the amount of content which says about your product. Here at Digiwoos, we help you in following up customers in response to managing the negative online review, for example, an unhappy customer may remove that review, edit it, or replace it with a positive one on the follow-up interaction.